Heya, everyone. 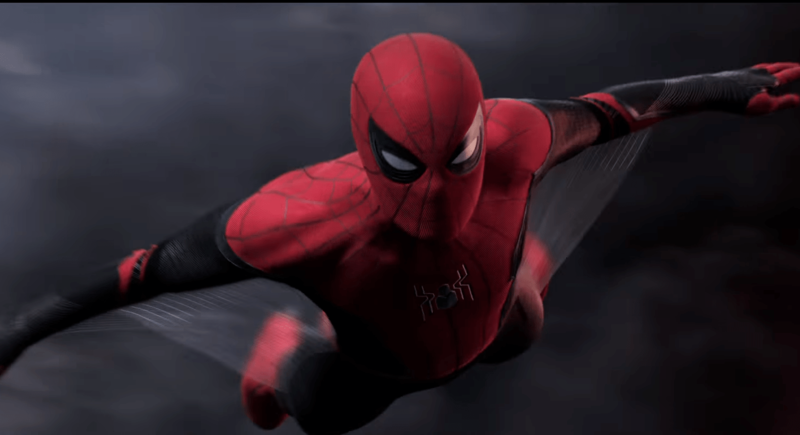 We finally got the official trailer for spider-man far from home got released on 15th and it was awesome. Special thanks to Cosmic Wonder Youtube for information Source. It seems like some people don’t know that Sony and Marvel actually released an international trailer as well that has different footage, it’s got about 30 seconds of different scenes than the US trailer, so in this article we will breaking that down and the whole trailer as well. You all can talk/chat to other fans on our new Discord Channel. This trailer is technically the first trailer for phase 4 of the MCU, so it’s really exciting, there’s a lot to talk about a lot to break down and some Easter eggs as well and some tiny tiny hints at Avengers endgame. 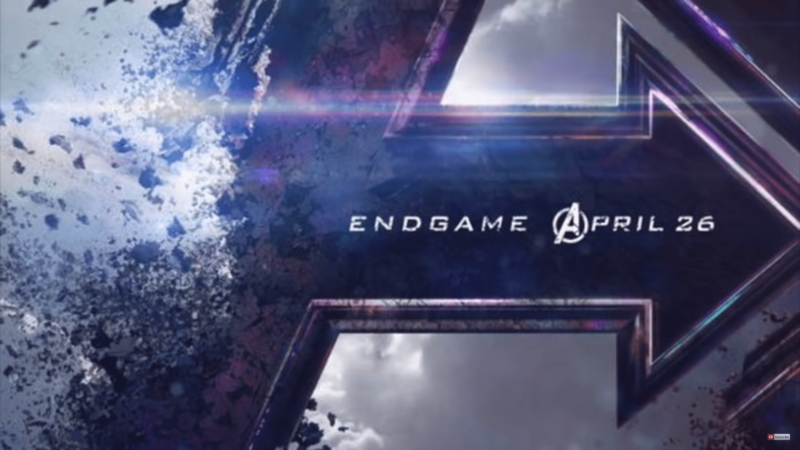 Now it’s not mentioned at all in the trailer nor are the events of Avengers infinity war but that was expected they’re not going to give anything away about Avengers end game in this trailer, so let’s just jump right into it. We are going to be break down both trailers in this article. We are going to combine them and talk about them chronologically. There was talking about a romance between happy and Aunt May after the trailer was shown at CC xP in Paulo Brazil and now we’re finally seeing it on screen and it’s very noticeable they’re doing it on purpose obviously showing that there’s a romance between them and Peter is kind of like what the heck is going on because he can tell – in the next scene you see Peter Parker packing and he says that he’s going to Europe on a school trip so this is obviously setting up the fact that he’s going to be far from home, he’s not gonna be in New York he’s going to be in Europe. we learned that Tony Stark actually sold the old Avengers Tower and the Avengers headquarters moved to upstate New York, well as you can see in this still somebody has already bought the building and has begun renovations on it since the trailer showed at CC XP there has been talk and rumors that this could be a fantastic four building or a Norman Osborn building out of the 2 – it’s more than likely a Norman Osborn building we haven’t seen him in the MCU and he’s a huge part of spider-man verse and at the time that this was filming and still currently Disney and Marvel do not own the rights to use the Fantastic Four in the MCU, so it’s more than likely an Osborn building. 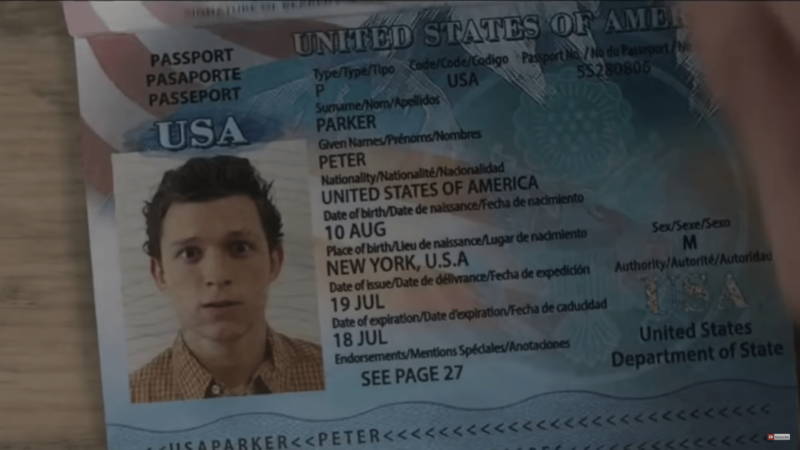 The next scene shows Peter Parker going to pick up a passport and this is actually a really cool Easter Egg if you notice his date of birth on the passport says August 10th that’s actually the date that when Spider-man appeared for the very first time in the comics August of 1962 so that’s a cool little Easter egg they did there. The next scene is a pretty big scene, he’s trying to pack for his trip and Aunt May tells him to pack his spider-man suit but he doesn’t want to pack his spider-man suit. We hear him say I just want to go on a trip with my friends so he doesn’t want to go with spider-man who wants to go ask Peter Parker he kind of wants to put down that mantle just for a little bit so he can enjoy this vacation with his friends and he even says that Europe doesn’t need a friendly neighborhood spider-man but another big thing about this scene is that if you look at his spider-man suit this is not the iron spider suit so he doesn’t have the iron spider suit for some reason. Kevin Feige has already come out and said that this movie is not a prequel to Infinity War or Avengers Endgame so that leaves us with the question why doesn’t he have his iron spider suit, why does he have his old suit this is obviously something that we probably won’t figure out until after avengers endgame has come out in theaters and then there’s a really cool Easter egg where we see Peter close his suitcase, you can tell that his suitcase is pretty old it looks pretty beat up but on it has the initials BFP, the initials stand for Ben F Parker which of course is Uncle Ben so this is his Uncle Ben’s suitcase that he now has. Peter Parker doesn’t actually pack his spider-man suit but in the International trailer we learned that Aunt May actually did. In the International trailer it starts off with Peter Parker having already packed up his things and is already at the airport going through customs a woman who works for customs is going through his suitcase and when she opens his suitcase what did we see right there on top is his spider-man suit with a little note from Aunt saying you almost forgot this. 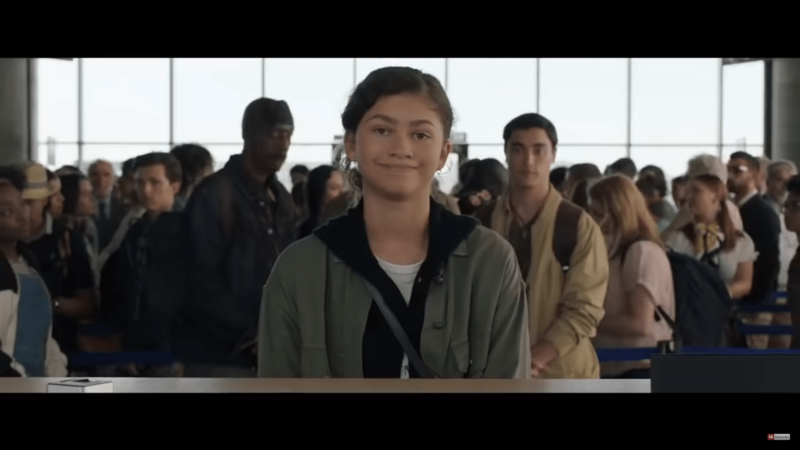 In the International trailer version it shows Peters friends going through customs starting with MJ and then it shows Ned and Betty and what’s interesting here is that Betty’s got her hand on Ned’s shoulder and Ned seems to have a newfound confidence in this trailer so maybe there’s a little bit of romance going on between the two of them as well. 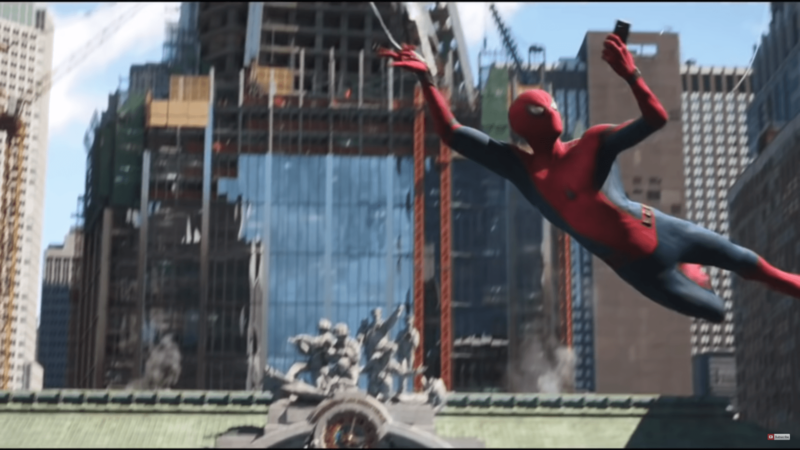 It then shows Peter Parker and his friends taking off and landing in Europe and then also in the International trailer we hear Peter and Ned talking Ned is telling Peter that they have two weeks in Europe and it’s gonna be great and then Peter says- I’m just going to enjoy my trip and hang out with MJ and this is where we see the romance start between him and MJ and if you notice they actually all call her MJ. It’s a pretty funny scene they showed the awkwardness of Peter Parker trying to flirt with MJ, here and she’s just messing with him and then going back to a scene that is in the international trailer and not the US trailer, we actually see Peter and MJ taking a nice little romantic walk together but ultimately you can tell that they both like each other and this is the start of a romance and we can hear Peter talking to Ned about that in the next scene in their hotel room, where he says I just want to spend some time with MJ, I think she really likes me dude and then BAM Ned gets hit in the neck with a tranquilizer dart from Nick Fury knocking him out. It was kind of funny to see Nick Fury alive because the last time we saw him he was turning to dust, again they’re not going to give anything about Avengers endgame away in this trailer but Nick Fury clearly comes back somehow so Nick Fury tells him to put some clothes on, let’s go for a ride and this is where he recruits spider-man for a mission. We then see Peter with the spider-man suit on in a boat with Nick Fury he actually did bring his spider-man suit they showed that to us in the International trailer, he brought his original suit but Nick Fury does still give him new suits and we see that in the very next scene where he’s actually wearing his red and black suit and it is actually a glider which is super cool, it’s really awesome to see them bring that into this movie and as you can see he’s using the suit to fly towards this chaos and destruction that is happening on this bridge in London, we learned that this chaos and destruction is actually the ‘Elementals’ attacking the Elementals are extra-dimensional humanoids who basically have control over the elements of the earth. In the comics there are four of them Hydron who is the Lord of the waters, Magnum who is the master of the earth, Hellfire who is the wielder of flame and Zephyr who is the mistress of the winds. So we hear Nick Fury tell Peter that he’s got gifts but he’s got a job to do and that job is to take out the Elementals and we actually see all of the Elementals throughout the trailer in the scene, we actually see Nick Fury and Maria Hill fighting Magnum then we go back to the bridge scene where there’s a lot of chaos going on and we see lightning and we see fire and the lightning is most likely Zephyr and the fire is Hellfire. We have another cool scene that shows spider-man using his glider suit to fly into the fire most likely going to fight Hellfire which we see very briefly in this still right here and then we have a very interesting scene with Happy Hogan happiest talking to Peter and he says you are all alone your friends are in trouble what are you going to do about it. 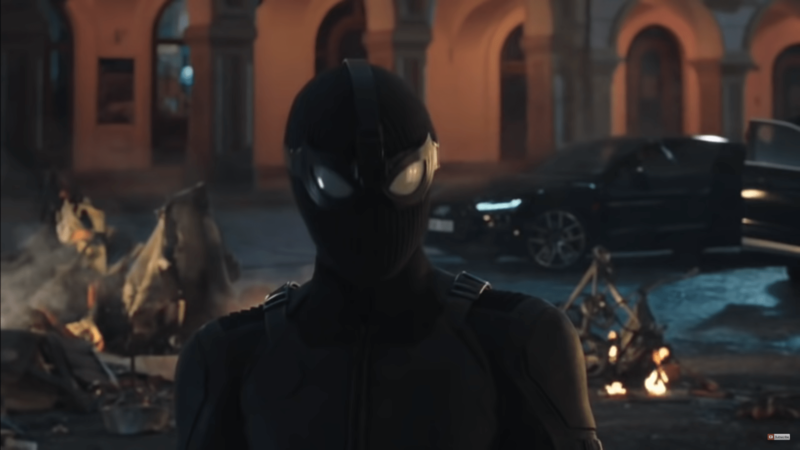 what this is is his ‘stealth suit’ this isn’t something that Peter already had this as something that Nick Fury gave to him. We know this because we have already seen leaked photos and a leaked video of Peter Parker in the spider-man stealth suit, we know this because in the leaked photos we saw on spider-man’s upper part of his chest a shield logo and what’s actually very interesting about this shot and the trailer is they actually blocked out the Shield logo not really a big surprise here Marvel has been known to do this they’ve been known to change and tweak a little bit of the trailers to try to avoid any spoilers that they can but the stealth suit is basically exactly what it sounds like it helps Peter Parker be stealthy and go about his business undetected the suit sort of adapts to the environment surrounding it and it also helps him see at night. We then go to a scene where there is an attack from the water elemental, they haven’t actually named the Elementals yet they could be going with the original names or this could actually be a version of hydro-man this elemental attacks and we see Peter Parker trying to help his friends and everybody else get to safety, then we see the elemental just deliver a huge punch to Peter Parker knocking him down and you can tell that he’s just very taken back by how strong this Elemental is. 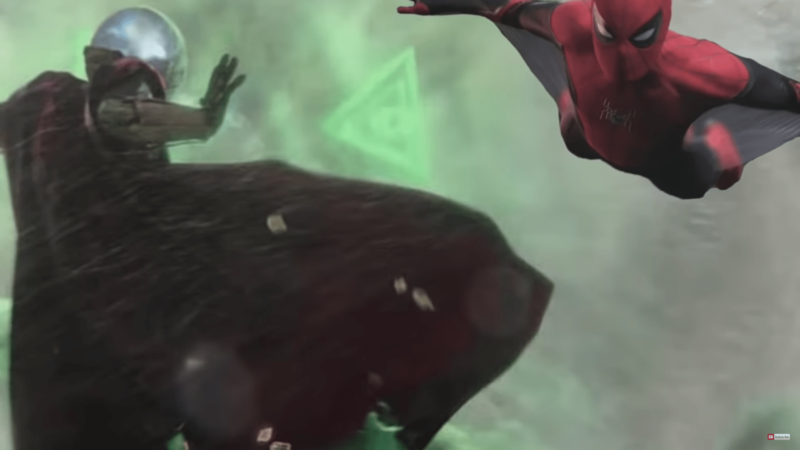 Then we have what I think is just the very best part of the whole entire trailer Mysterio shows up he makes an epic drop in Dan it cuts to Peter Parker hanging off the edge of a building soaking wet and then Mysterio says you don’t want any part of this and begins to attack the water elemental, we see the beams come out of his hands and then we see him fly and go fight the water elemental. Mysterio is actually a person named Quentin Beck and Quentin Beck does not have any superhuman powers at all but he is very very skilled and talented he is an expert designer of special effect devices and stage illusions, a master hypnotist and magician and a chemist and roboticist, so he can create devices such as his suit that allow him to fly and create smoke and if you look at his suit it actually looks like Chitauri tech this is the same tech that vulture from spider-man homecoming was collecting. So, it’s possible that he got this tech from vulture we know that Michael Keaton is going to be in this movie as vulture so maybe Mysterio got this tech from vulture or maybe Peter Parker will have to work with vulture somehow to take down Mysterio because although this trailer does depict Mysterio as a good guy, he is actually the villain in the comics. Mysterio actually wants to be a hero he wants to be an Avenger, so his plan is to defeat spider-man and show everybody that he’s a better hero and what Mysterio does is create illusions and that is probably what the Elementals are and spider-man far from home we learned from Jake himself at cc XP that Mysterio gets recruited by Nick Fury. He gets recruited by Nick Fury because he is supposed to be an expert on these Elementals but the reason is he’s an expert on them is because he actually is creating them they are his illusions and his plan is to make it look like he’s actually a hero and a friend of spider-man and then defeat spider-man and again he looks awesome we even get to see him where his fish ball helmet I think the character is done amazingly. 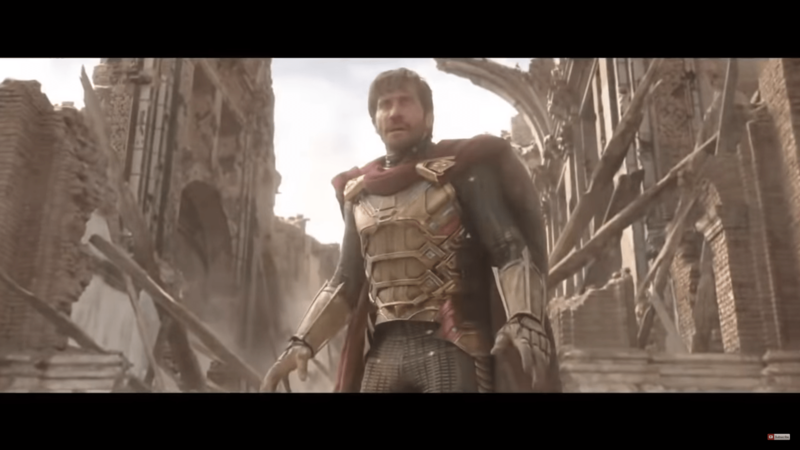 I think Jake is a perfect actor to play Mysterio and overall this is just a phenomenal trailer, the next trailer will probably come out after Avengers end game and it will probably give us a little bit more info because we will have known what happens in Avengers endgame, so the next trailer probably won’t come until after Avengers end game and that will be a full trailer although this trailer is long and really really awesome it’s still a teaser trailer so the next one should be a full trailer with more information.